Every year since 1980, the tea master who grew this has taken this Oolong out of storage and lightly roasted it. He then put it back into storage and waited for another 2 years or so before taking it out of his tea vault to roast it again in order to remove moisture. Since 1980! 38 years of tea roasting certainly validates the Keats quote above. And this is one of the many reasons to love tea and the people who are dedicated to this kind of craftsmanship. What were you doing in 1980? Were you even on the planet yet? To say this is rare is an understatement. Especially since tea making in Taiwan changed around the Mid-1980s. Prior to that tea was hand-rolled in canvas bags. This kind of processing created a tea that was not as tightly rolled as it is currently with the use of machines. Firing at the right temperature (often higher) was also key for this original kind of processing. The end result being a tea with a very thick and unique taste that is very different from any other teas you might have tried before. Notes of roasted chestnuts, stone fruit, baked bread, passionfruit, butter and whispers of cocoa are just the tip of the iceberg. It’s rich with divine depth of character. This is clearly not a mainstream tea. And, it’s not an everyday cuppa. It’s an experience reserved for special occasion. We often joke that teas like this should only be shared with those who are truly worthy and to choose wisely. This is only sold in 1 ounce amounts because of how little there is and because there is no more left of this particular lot on the planet being roasted by this tea maker for that particular year. Should you decide to secure some of this magic, you will not be disappointed – especially if you are roasted oolong lover. Please enjoy this extremely RARE DISCOUNT of 25% OFF this extremely RARE 1980 AGED OOLONG on day 24 of our 25 Days of Tea Giving. 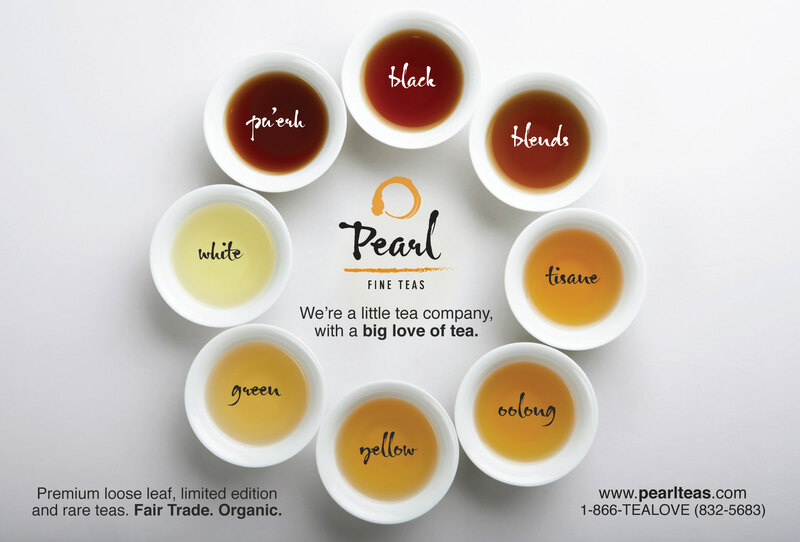 Use Code TEAGIVING24 at checkout on the Pearl Fine Teas website. Think of this discount like the Rare Christmas Comet that only shows up every 11 years. Perhaps you can watch the comet while sipping this 1980 Aged Oolong…? Home to some our most favorite Oolong teas which most definitely includes Baozhong. Pouchong or Baozhong in Mandarin, means “wrapped in paper” referring to an original older and unique processing style from the past when the tea was literally wrapped in paper during the drying process. 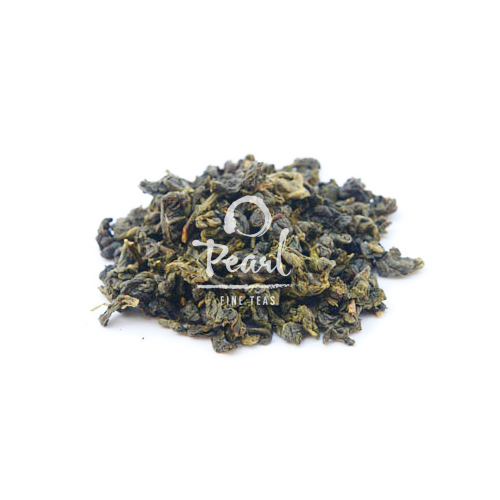 For Oolong lovers and TeaNerds reading this: Our Baozhong is oxidized at around 12% which is considered light oxidation and creates an end tea product that falls somewhere between green and oolong. It lacks the sharpness of some greens and is much more mild than other oolongs. It’s sweet, fresh, fruity, floral and buttery. It requires no sweeteners. In fact, adding any sugars would be almost down right sacrilegious and would ruin the complexity this tea has to offer. Tea grown within Pinglin county in Northern Taiwan and processed in a specific style is considered the best quality of Pouchong – which is where ours is from. The leaves of Baozhong are large, twisty and dark green. For brewing, its similar to other greener oolongs in terms of water temperature (175°F) and time. This tea can handle multiple infusions. I’ve gotten up to seven! That makes for a pretty strong case for drinking tea daily and trying Baozhong specifically. If you are a lover of Oolongs or are intrigued to try it for the first time, please enjoy 25% OFF our Baozhong at checkout by using code TEAGIVING10 on the website. You won’t regret welcoming this tea into your life. I kicked started my second full day here in Taipei with a beautiful Asian breakfast (rice, bok choy, eggs) good conversation and some Oolong tea. It gets better. I decided not to join the group that was going to a eco-garden and instead continue to wander around Taipei. Karen Hartwick joined me. We left the Dong Wu and walked over to where they sell dried herbs, teas, flowers, fruits, Chinese medicine etc… On route we ran into David, the nephew of Jackson Huang and Thomas Shu (2 of our leaders for my 2nd Taiwanese Oolong Study Tour.) David was on his way to find a temple where one of his friends visited last year and told us the story of how only 1 month later his friend met a woman and they were married. Evidently, people go to the temple to pray for love. So, we’ll call it the Temple of Love. We followed him to see what it was like. 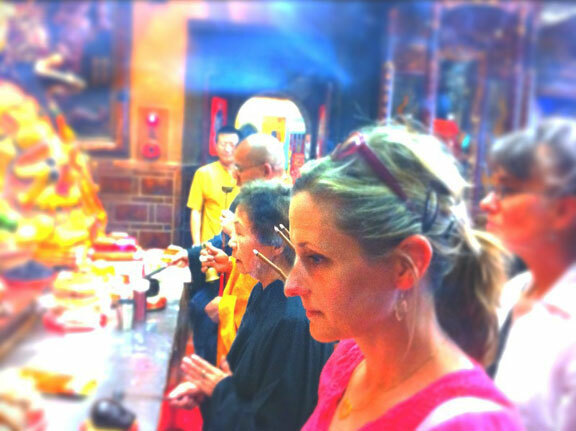 So many people in and out of the temple, burning incense and praying. Karen and I were snapping tons of photos. David asked us if wanted to participate in a ceremony. We were game. David was our translater to our guide, who walks you through this elaborate process which involved chatting with 5 different Gods, introducing yourself (ie: Hi. My name is… and Im looking for…) burning some incense and then eating some candy to seal the deal. We were given these special amulets to keep with us so that the “energy of the Gods” could work its magic. We shall see. Of the 3 of us, one is seeing someone, one is seeing someone but may want someone new, and one has no interest at the moment in seeing anyone. I’ll let you figure out who is who. One of the nicest parts of the experience was being in the temple at the right time while monks chanting with their melodic voices. Incense burning. People praying. It was really quite magical. I felt I was in the right place at the right time. Once we left the temple, we meandered the streets, peeking into windows taking in all visual and aromatic sensations that is Asia. We stumbled upon what David said was one of the oldest roads in Taipei. Simply charming! David happened to be standing in front of a building with an open door that turned out to be an art gallery. We decided to go in. Quite spectacular to see the modern art just inside the oldest part of Taipei. Afterward, he takes us to the oldest and apparently Best Noodle Shop in Taiwan. We enjoy a local lunch in a hot spot for a mere USD$1. Karen and I then hopped in a taxi and headed over to Wisteria Tea House to sit, relax and talk tea. Wisteria is where director Ang Lee shot “Eat, Drink, Man, Woman” and I could see why. It’s gorgeous. We enjoyed the spectacular entrance into this private little world of tea and then found some of our own teapeeps sitting on mats in the back room dining and sipping. Karen and I enjoyed 2 oolongs that were on the menu. One was an aged oolong. Tasty, but admittedly my 1980 Aged Oolong that I purchased last year trumped theirs. We also shared a pot of milk oolong. I noticed on my way out of the tea house that there was the teapot and burner set that Ive been searching for all year! Tempted, I almost broke down and purchased it retail. Im glad I held my fire because I would end up finding a much better, higher quality version later in the trip. I look back at these last 2 days prior to beginning TOST and realize what a good idea it was to come a few days early. We officially kickstart the tour this evening with a welcome ceremony at TTMA. That means that tomorrow all systems are GO! and we’ll be moving at the speed of light as we wind our way through the Alishan Mountains and make Classic Tung Ting Tea. Tung Ting is also known as Jade Oolong and is one of my favorites. I’m sipping tea in Taiwan. I’m happy! D.C.’s Chief Leaf was 1 of 10 Tea Professionals from the United States and Canada to have completed a week-long intensive study of oolong teas from withering to final product in Taiwan from June 20-28, 2009. Ms. Scott was part of this exclusive first group of foreigners to produce tea at the prestigious East Coast Taitung Branch, Tea Research and Extension Station – an unusual and rare opportunity for anyone other than Taiwanese tea growers. The group was lead and organized by Thomas Shu, ABC Teas & 3rd generation Tea Master, Josephine Pan, Organic Teas Only, and the Taiwan Tea Manufacturers Association (TTMA). The week kicked-off the with hands-on processing of Baozhong Tea (Wen Shan Tea District) which took approximately 13 hours to complete. Their second day was highlighted by a visit to the Shan-Ben Tea Garden, producer of the 1st Place Winner for Green Oolong Tea at the World Tea Championship in Las Vegas earlier this year. Winner Ken Rudee, incoming Chairman of STI and Board Member of the Tea Association of the US, returned to Taiwan to present 82-year-old Mr. Wu with the prestigious award. By day three, they had processed Pressed Oolong (Hua-Tung Tea District) and completed the “bootcamp” with the hand processing of Formosa White Tip Oolong Tea/Oriental Beauty (Ta-Chiang-Wu/Long Tan, Touyan)-Taiwan’s most precious tea. By weeks end, the group had cupped and tasted over 60+ teas from Bai Mu Dan to Aged Oolong along with some that have not been sampled outside of Taiwan. A Master Cupping session was held at the ABC Teas Factory and was led by Norman Shu. Mid-way through the week they were able to take a short break at the Luminous Mountain Spring Resort & Spa and enjoy the natural hot springs. Their week culminated with a Grand Tea Tasting at TTMA, a 10-course farewell dinner and closing ceremony on Saturday, June 27th. Certificates of completion were given. Taiwan Public Television (the equivalent of PBS) was there to interview and film events earlier in the week and was scheduled to cover the closing ceremony to gather more footage for a 15 minute television special on their oolong study tour. Ms. Scott granted an interview to the TV Station. Many of the teas purchased will be available this fall in time for the Holidays. If you enjoyed reading this post, please consider sharing with a friend. We look forward to your comments! Happy Sipping! Greetings, TeaPeeps. As many of you know I just spent the last 10 days in Taiwan on what was called a Oolong Tea Study Tour, sponsored by TTMA (Taiwan Tea Manufacturers Association). Quite frankly it was more a bootcamp than a tour – which was fabulous! It was an intense learning experience along with some time to purchase new teas for our 2009 collection. Studying with Thomas Shu, Norman Shu, Jackson Huang and other notable Tea Masters was more than just a treat. It was the opportunity of a lifetime! I’m still gathering my thoughts, going through hundreds of photos and video and will write and share in the days to come. First of all, I have to find more time to blog. This is crazy. So… when I was making up my business cards I went through the typical list of titles: President, Owner, CEO, Tea Specialist etc etc etc. Nothing seemed to fit. I kinda liked the “Chief” in Chief Executive Officer but it just sounded way too serious, and ominous. Not me. So I kept Chief (which I am since I own the company) and Leaf just made sense. I’m the Chief of all Leafs for Pearl Fine Teas. They seemed to like what they saw and hopefully tasted (free tea to the press) and decided we were worthy of a write up, especially since I’ve been awarded the title of Certified Tea Specialist — The 1st in DC and 1 of 23 Nationally. 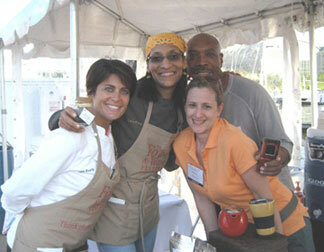 Local Kicks ran a story, and then NBC Washington and Washington Home and Garden picked it up. Yippee! My quest for the “Tea Master” title begins on Friday, June 19th as I take an extraordinary long flight to Taiwan to spend a week processing, cupping, discussing and learning about Oolong Teas. from a 3rd Generation Tea Master! You know I’m crazy for Oolongs so this is like… a dream come true! I’ll be bringing back some limited-edition oolongs processed by yours truly. I may even be persuaded to sell some. I wonder how much weight I’ll from sheer dehydration? It is Taiwan in June. They better make me an iced tea.